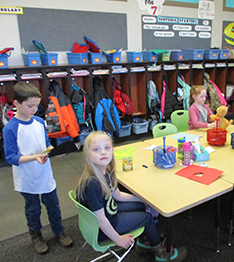 Here you’ll find all the latest news from Sunset Elementary School—everything from important notifications to fun articles and upcoming event details. We will update you with announcements and news stories here, so bookmark this page and check back often! News reports indicate the Momo creature has been seen on Facebook, YouTube, and in popular video games such as Fortnite. These Momo videos feature an odd bird-like creature that is said to encourage self harm and suicide. Park County School District 6 has confirmed the online existence of the meme as have other school districts in our area. There have been a few reports of children in the Big Horn Basin following through with challenges posed by Momo. Counselors and administrative personnel as always available at our school to address student concerns regarding this issue. We encourage and advise you to talk to your children about your expectations for their electronic and internet usage. Be mindful of the videos your children are watching and supervise the games they are playing. We appreciate your partnership in our efforts to support our students and their safely. Please see below for more information regarding the Momo challenge, and feel feel to contact us with any questions or concerns. The time is here when the weather cooperates and our classes participate in field trips to enhance their classroom learning. Just a few things to keep in mind, if classroom teachers want parent volunteers they will get the word out to our parents. If you are asked to volunteer, please be sure you completed the volunteer application at least two weeks prior to the classroom activity or field trip. This is a district procedure. Thank you to all who participated in the Box Tops for Education fundraiser. Thank you for supporting our school and thanks to our fabulous PTO for sponsoring the competition. Our school earned $918.60. $208 of that was from extra dimes. Congratulations to Mrs. Woods' class for bringing in the most box tops. Mr. Roemmich's class won the snowball fight. They had the least amount of snowballs thrown at them! Check out our latest newsletter from the home of the Colts!